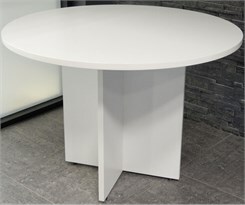 Quality scratch resistant White laminate resists rough wear and wipes clean with just a damp cloth. Measures 42" round by 30" high. Shipping weight 76 lbs. Ships unassembled for safety in transit. PRICE INCLUDES SHIPPING! (Truck shipment - See Terms & Conditions). IN STOCK! Mocha Modular Laminate Conference Tables from 6'-24'! 6', 8', & 12' Cherry Conference Tables from $399!